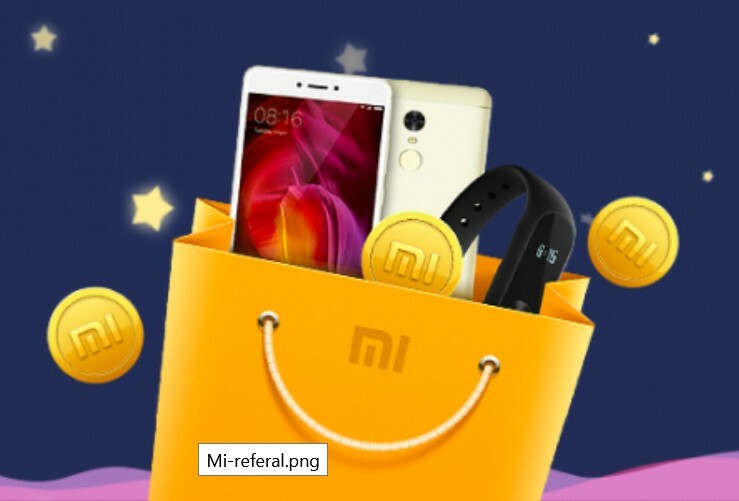 Xiaomi has announced the ‘Reward Mi 2.0’ referral program that will allow fans to win attractive prizes. As part of the program, users will have to share their unique referral link with family and friends. 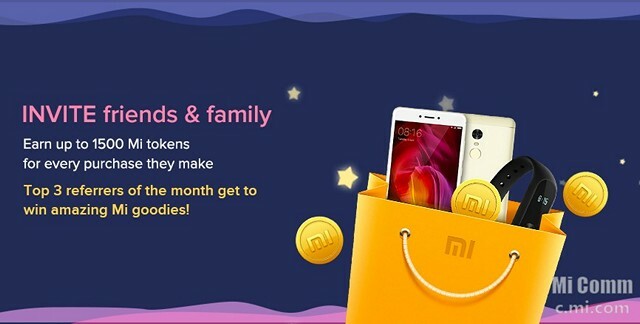 Once the referred users sign up by clicking on the link and make purchases on Mi.com, both the new user as well as the referrer stand to win rewards in the form of ‘Mi tokens’ that can then be redeemed to get discounts on future purchases. 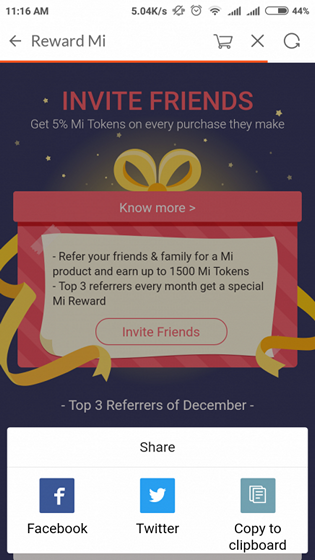 According to Xiaomi, each referrer is eligible to win up to 1,500 Mi tokens through referrals. Xiaomi says that the top referrers every month will get attractive goodies from the company’s product portfolio. This month, the top referrer stands to win the recently-launched Redmi Y1 (3GB + 32GB), while the runner-up will get a Y1 Lite. If you end up at number three, you’ll still end up scoring the Mi VR Play 2, which isn’t too shabby at all. The company also says that the rewards for the three winners will be updated every month. If you don’t end up in the top three, don’t despair, because everybody stands to gain something from Reward Mi 2.0. 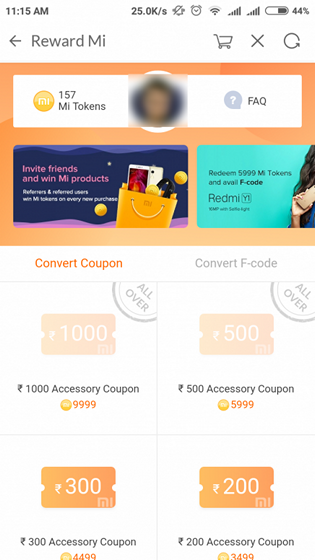 According to Xiaomi, referred users will get 10% and referrers will get 5% of the total purchase value in Mi tokens for every purchase made through the referral links. 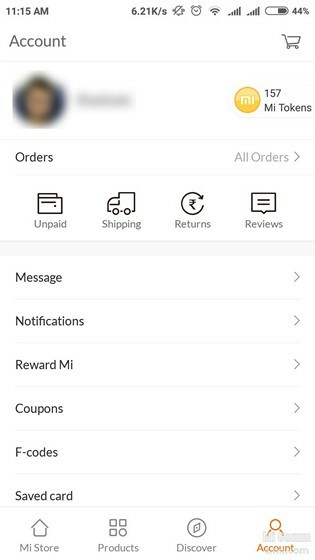 First off, download and install the Mi Store app (free) from the Play Store if you don’t already have it on your device. Now fire it up and go over to Account > Mi Tokens. 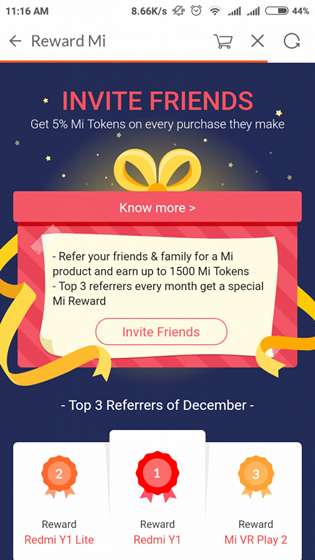 Click on the image that says ‘Invite friends and Win Mi products’ to get to the Mi Referral Program’ page. Now click on ‘Invite Friends’ to get your referral links. As you can see, you will get 3 options to share your unique referral link – Facebook, Twitter and Copy to clipboard. That’s it, folks! You can now share your referral link with your family and friends!